RS485/232 serial programming control commands media files work HD player. * Turn on the power, player automatically play media files, 24 hours of loop playback, no standby mode, 1080P HD image output. * Support for HDMI, AV (CVBS composite signal) output. * Support the connection of external 24 button control player media file playback process. 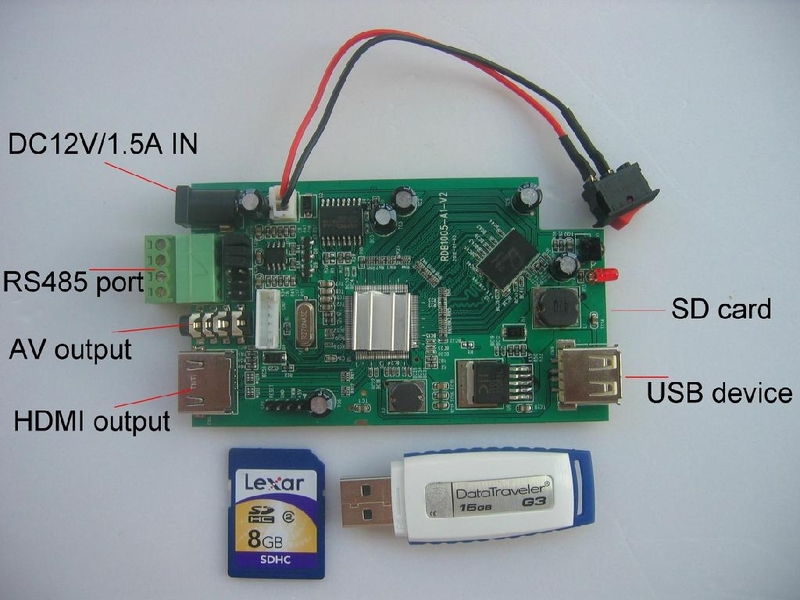 * Support the connection communication serial port RS485 command code control player media file playback process. Send characters / data:@00:09$ =Command player 09 this file play work. Command control play mode, require creation the folder and text documents. ,' lalalalala.mp3 ' is the ' audio ' folder inside contents. "05=video/*. *" =Digital key ' 5 ' Command select play file, 'video' is a folder name, '*. *' =play 'video' folder inside all media file..
Just divide a file into different time periods. 03N=620,820, →During playback, the input of the numeric keys is not responding. After playing, return to the 00 section. 01_01=100,300 → Play after 01, continue to play 01, the same is also a loop function. 01_04=100,300 →Play 01 after the jump to 04 play, the same is also automatically jump play function. timeout=60 60- pause 60 seconds after the automatic play. UP, --- Direction key upward. Select the direction key 'right' is the video file playback function, every 10 seconds for a period of time. 'left' is back for a period of time to play, back for a period of time 10 seconds. Setup photo slide show background music play mode(play photo while play music) : In the root directory create 'audio' folder, 'audio' folder inside save needs play MP3 file..
'Repeat'= Setup single file play and all file loop play. 'Setup'= Enter the setup menu, select 'Return' to return. Contains the basic system settings • Audio • Video Settings • MISC-USB upgrade the firmware upgrade menu. Note: When the small size file play, not full-screen display, in the setup menu, select 'VIDEO' to 4:3 mode.